Have you had any cosmetic surgery? What are your views on those that do? I must admit, I am very much of the opinion that if someone doesn’t need altering under the knife for medical reasons, they should learn to live with what they think their imperfections are. Probably the classic is breast implants for woman; I am yet to meet a female who doesn’t think they have something they want to change about their bust. Hang Mioku – A Self-Confessed surgery addict, Hang became so addicted to plastic surgery that surgeons refused to perform any more procedures on her (they thought this was a psychological disorder). This led to her injecting cooking oil into her own face to make it larger! Pete Burns – Another surgery addict, Pete’s face looked incredibly swollen after surgery to try and fix a lip enlargement gone wrong! Versace – Fashion star Donatella Versace had a variety of procedures turn out bad. Although the above photo doesn’t show it too well, she has had her share of bad nose jobs in addition to the bad lips! Michael Jackson – How can we forget icon MJ? Where do I even start with him. One would forget that he looked normal once upon a time….. The Catman – My final choice has to be the Catman. 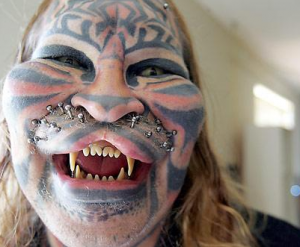 Dennis Avner has spent almost all his life trying to look like a Tiger. A combination of tattoos, implants, dentures and several implants have helped him get there. Akin to a Tiger, he is quite scary! Perhaps some of the above examples are extreme, but I would still have Pryers Solicitors on speed dial in case anything went wrong if I ever went under the knife! Forget reading stories – anyone got any first hand stories of procedures gone wrong for people they know? Comment anonymously if you want! No procedures or procedures gone wrong. Bf’s sister had a breast reduction and thankfully there were no complications. 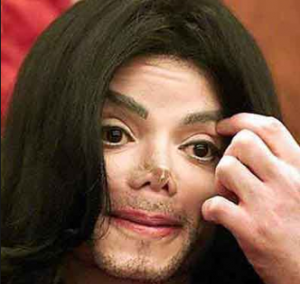 I don’t judge those who have plastic surgery, but I could never do it. I am TERRIFIED of surgery, needles, etc and would die from shock. I wonder what the insurance aspects of “optional” surgeries are. Interesting topic. Holy crap, what in the worls is wrong with these people! I have more respect for the catman than any of the others. At least he know what he was shooting for. It would be interesting to see what he looks like 40 years down the road. Bwahahahahaa. We know someone who had the breast implants and the tummy tuck and the tummy tuck did not turn out as expected. She now says she wishes she had never done either as she could have easily just ate better and kept fit on her own. Those photos, I just don’t know what to say except to each their own. Cheers mate. Of course those are extremes, but I would never judge a woman who wanted to get a little something done. Let’s say a woman really, really hates her nose, and just changing that one thing could really give her some much needed confidence…then I see nothing wrong. I think women are way more sensitive then men when it comes to their looks and it’s not always easy to just accept something. As I get older, I can really understand certain procedures (mostly the non-invasive ones like botox or fillers). I’m not sure I’ll ever do any “work,” but I’m not totally against it either. Dude, those pics make my stomach turn. 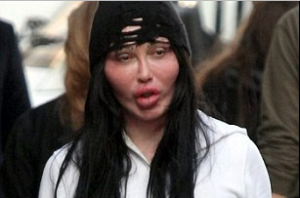 I can’t imagine being addicted to surgery when you look as hot as I do. Ha! 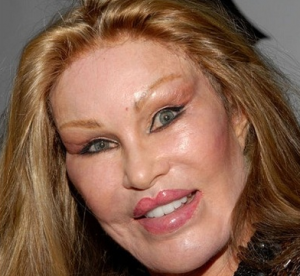 And that is why I’ll never get cosmetic surgery. I’d rather get wrinkles thank you very much! I’d be gutted if i’d spent all that money and ended up looking like one of those guys!